A number of SLFB members were privileged to be asked by the band’s founder, Major George Whittingham, to be part of a band put together to celebrate his birthday. A similar event occurred last year on the occasion of his 90th birthday and the success of that event led to a repeat for his 91st. George conducted the band through virtually all items during the evening, held at Bromley Salvation Army hall, as well as compering the evening which lasted for just over 2 hours – quite an achievement of stamina as well as memory as many items were conducted without a score. There were many well known faces from the Salvation Army brass band world (see photograph below) as well as some from non-SA bands and professional musicians. The programme commenced with the hymn tune ‘Pilgrims’ which the congregation then joined in, followed by the march ‘The Canadian’ and included many SA classics such as ‘Army of the brave’ & ‘Just as I am’. Guest soloist Tom Neilson played the cornet solo ‘Glory to his name’ and items from the orchestral classical repertoire were the the flugelhorn horn solo ‘Solveig’s Song’ played by George’s great-nephew, Kevin Whittingham and the tenor trombones combining in ‘The Swan’. The cornet section played ‘Bugler’s holiday’ and joined with the trombone section in ‘Never give up’. The euphonium section was featured in a duet written by Derick Kane which he played with Adrian Horwood – ‘That’s the spirit’. Ben Dixon was featured as E flat tuba soloist in ‘Celestial Morn’ conducted by Darrell Scholes. The grand finale to the programme was a favourite of many – ‘The Kingdom Triumphant’ which left the band breathless after it’s long, slow phrases and left the audience, if not breathless, enthralled by the sounds and variety of music heard during the evening. 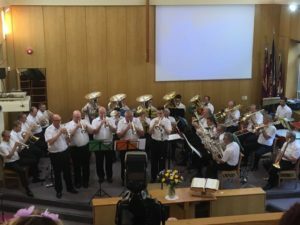 South London Fellowship band were privileged to be asked to support the celebration of Simon’s life at Croydon Citadel on 14th August after the service at the crematorium. The turnout, both from members of the band and friends and family, was high – particularly for the middle of the summer holiday period. The congregation was near capacity and the band, with friends who expressed a wish to join in, overflowed the platform. 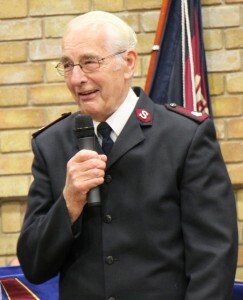 Many tributes were paid by a number of friends from both past and present as well as to Simon’s dedication and commitment to his work in the Salvation Army’s music editorial department – these included a video message from Stephen Cobb and Andrew Blyth and a word in person from Richard Phillips. Comments were made about Simon’s sense of humour and his quiet, unassuming manner, seeing what needed to be done and getting on with it before being asked, as well as taking responsibility for young people on work experience. His musical talents were praised and reference made to his high quality euphonium and baritone playing, piano playing, editorial eye and musical ear – the latter being used to great effect in the background of recent ISB recordings. His love of being with family and friends, appetite for food and role in music schools were also highlighted during the evening. Music for the evening was chosen by family and included the tunes Ascalon, And can it be, Jerusalem & In Christ Alone. A varied programme of band items were requested – Songs of testimony, Of whom I sing, Brillante (Euphonium solo on this occasion by Adrian Horwood but in memory of Adrian and Simon playing the duet version on a number of occasions over the last year) Prelude on Lavenham, and marches Celebration and In the King’s Service. 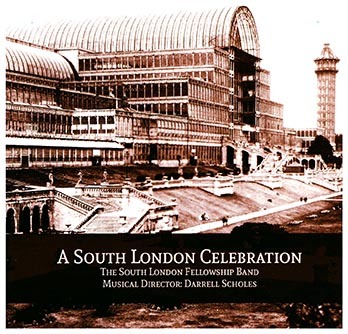 Towards the end of the evening the ISB cd featuring Simon as baritone soloist with the ISB in ‘My story and song’ was played. The evening was truly a celebration and from the band’s point of view a tribute to a man who had made a positive impact on the group during his 18 month membership – an activity which he threw himself into and enjoyed immensely. It was with some shock and disbelief that we heard of the sudden and unexpected passing of our Assistant Principal Euphonium, Simon Birkett, on Friday July 21st. Simon had sustained an injury in June in connection with a charity event for The Emily Ash Trust, an injury from which Simon had not fully recovered and which sadly proved fatal. Simon became a full time member of the band two years ago, and rapidly formed, with Principal Euphonium Adrian Horwood, a most formidable euphonium section – the envy of many. Adrian and Simon were featured, to much acclaim, as euphonium duettists throughout our recent Pentecost tour of the Netherlands. Our first scheduled rehearsal was just three days after Simon’s passing. The larger part of the first half of the rehearsal was readily reserved to a meditation, led by Band Chaplain Roger Gadsden, centring on Simon, Simon’s wife Rosie and Simon’s family. Reading from 2 Corinthians Chapter 1 – “For no matter how many promises God has made, they are ‘Yes’ in Christ” – Roger spoke of God’s great comfort and compassion at times of need and distress. Following a prayer, the band played the Prelude on Lavenham – a favourite of Simon’s – sensitively directed by Darrell Scholes, who then read to the band a tribute to Simon that had been placed on Facebook by Dean Jones. Earlier, Major Doug Hayter brought all the family and our words, thoughts and actions to God in prayer. Simon will be sorely missed by the band as a player, as a good and kind friend, and as a vital part of our fellowship. We prayed on Monday that God might uphold Rosie and her family at this difficult time – and we continue to express that prayer.